ORONO, Maine -- Brice O'Connor (Londonderry, N.Y.) scored on the rebound of a Nick Pryor (Woodbury, Minn.) shot from the slot 3:43 into the second period and it proved to be the game-winner as the University of Maine men's ice hockey team skated past Merrimack 2-1 to win the Hockey East quarterfinal series. With the victory, Maine advances to the TD Garden and will face Boston University on Friday, March 16 at 8 PM. Maine improves to 22-12-3 on the season, while Merrimack falls to 18-12-7. Maine took a 1-0 lead with a power play goal at 11:38 of the first period. Will O'Neill (Salem, Mass.) got the puck to Spencer Abbott (Hamilton, Ontario) on the blueline. He passed the puck to Adam Shemansky (Robbinsville, N.J.) on the goal line. Shemansky tried to pass into the slot, but the puck was deflected back to him. He then returned it to Abbott who fired the puck past Merrimack goalie Joe Cannata. For Abbott, it was his 20th goal of the season. Maine extended its lead to 2-0 early in the second period. Abbott carried the puck up the ice and slid it back to Pryor who was skating alone down the slot. Pryor unleashed a shot that Cannata was unable to control. O'Connor was right on the post and fired the puck into the back of the net for what would turn out to be the game-winner. For O'Connor, it was his third goal of the season and second game-winner. Merrimack pulled to within one goal at 9:16 of the second period. Jesse Todd had a shot that Maine goalie Dan Sullivan (York, Pa.) stopped, but the rebound went right to Ryan Flanigan who was able to beat him. For Flanigan, it was his 11th goal of the season. The goaltenders did the rest, turning away the rest of the shots that they faced. The Black Bears nearly had an empty-net goal in the final seconds, but the puck went just wide of the net. Maine outshot Merrimack 32-21 in the game. 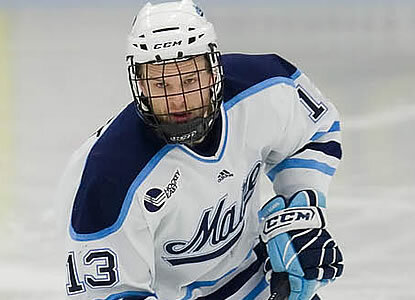 The Black Bears were 1-for-6 on the power play, while Merrimack was scoreless in its lone chance. Maine goalie Dan Sullivan made 20 saves in goal. He improves to 21-9-3 on the season. Cannata made 30 saves for Merrimack. He falls to 17-12-7. Maine will now face Boston University in the Hockey East semifinals on Friday, March 16. The game is slated for 8 PM at the TD Garden in Boston. The University of Maine ticket allotment will go on sale through the Maine Athletic Ticket Office at Alfond Arena on Monday at 8:30 AM. Tickets on Monday will be available to Black Bear Club members, season ticket holders and students. Tickets for the general public will go on sale Tuesday. Tickets will be available for pick up on Wednesday for the ticket office or at the TD Garden team will call booth.